(CNN) -- England have ended the fourth day of the fifth and final Test against West Indies in Trinidad on 80-3, as they chase quick runs in what looks a vain attempt to pull off an unlikely series-saving win. 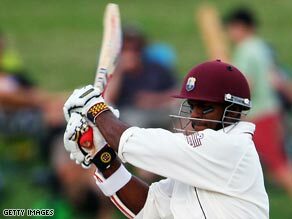 An unbeaten century from Shivnarine Chanderpaul helped put West Indies into a commanding position. Having dismissed the hosts deep into the final session, the tourists lost quick wickets as they tried to force the pace at the Queen's Park Oval. Needing a victory to square the series at 1-1, Andrew Strauss' side spent all day attempting to bowl out their opponents, eventually dismissing the West Indies for 544 -- giving England a meagre two-run advantage. Overnight pair Shivnarine Chanderpaul and Brendan Nash (109) both hit hundreds for the West Indies, with Chanderpaul finishing unbeaten on 147. The pair put on 234 befofe Nash eventually fell to a Paul Collingwood catch at second slip off the bowling of Stuart Broad. Captain Stauss was first out in reply, giving a caught-and-bowled opportunity to opposite number Chris Gayle for 14. Owais Shah then perished in the next over for one, caught behind flashing at a wide delivery from Lionel Baker. Alastair Cook was the final England batsman out, again caught by wicketkeeper Denesh Ramdin off Ryan Hinds for 24. But Kevin Pietersen remains at the crease on 34, and he appears England's last hope of fashioning some quick runs before declaring and attempting to bowl out the West Indies on the fifth and final day.